Would the real “real world” please stand up. Instead of discussing which type of activity – procedural, conceptual, or applied – we should use, a more constructive conversation would be about how often and when. For instance, is it more effective to start a unit on linear functions with an open-ended problem (e.g. Dan’s Groceries), an application activity (e.g. our Domino Effect), or a procedural task (e.g. Khan Academy’s activity on slope-intercept form)? Also, within the unit, how much time should we allocate to each type of activity, i.e. how much time should we spend in each world? I highly encourage everyone to read Dan’s original post (including the comments!) and Mathalicious’s reply. 1. 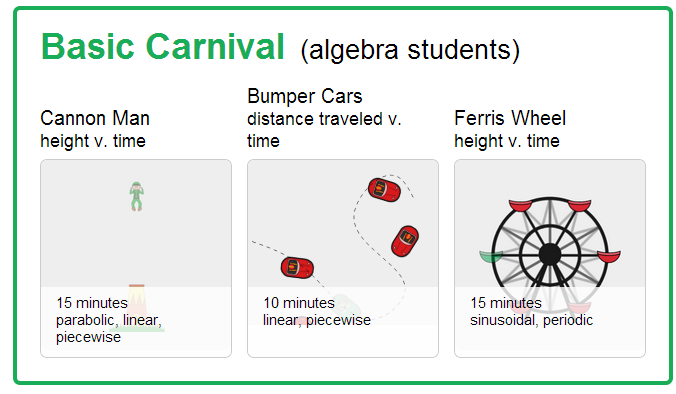 Function Carnival–Students graph the motion on three rides. They can do this in class on computers or iPads. The teacher dashboard rocks too. I made a quick handout here. 2. 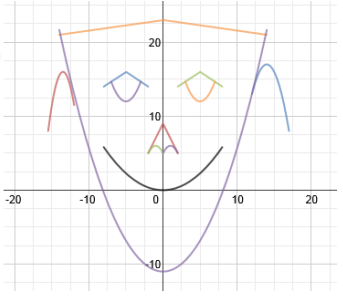 Des-man–students make faces using functions. This will also help reinforce domain and range. I have made a quick handout for that one too. Updated 3/20: Here is a quick video of the teacher dashboard for both the Function carnival (0:00-2:10) and Des-Man (2:10-End) that we did in our workshop with about 20 participants on using tablets in the classroom. There is a little down time that I failed to edit out. I also want to give a big shout-out to Desmos for responding rapidly to a small issue we were having. I try to abide by these tips from the Presentation Zen master, Garr Reynolds. So should you. Here is a template that can be used to help organize your explore-flip-apply lessons. I have added comments within the template to help you think about the development of the lesson. I have also created a flow chart to help you think of how the lesson of the unit need to be split. While I did not always follow this model, it was useful for my weekly planning. I’ve always thought the first day of class was anticlimatic. Students come buzzing in, excited to begin college for the first time (most are incoming freshmen). What did I usually do to fuel their excitement? All of the energy that previously existed was gone upon exiting. Sure, I’d do the name game and let them tell a little about themselves (or introduce a partner). I’d even go around the room and attempt to call everyone by name, occasionally eliciting a few laughs. Are you sure your not Bob? You sure look like a Bob. 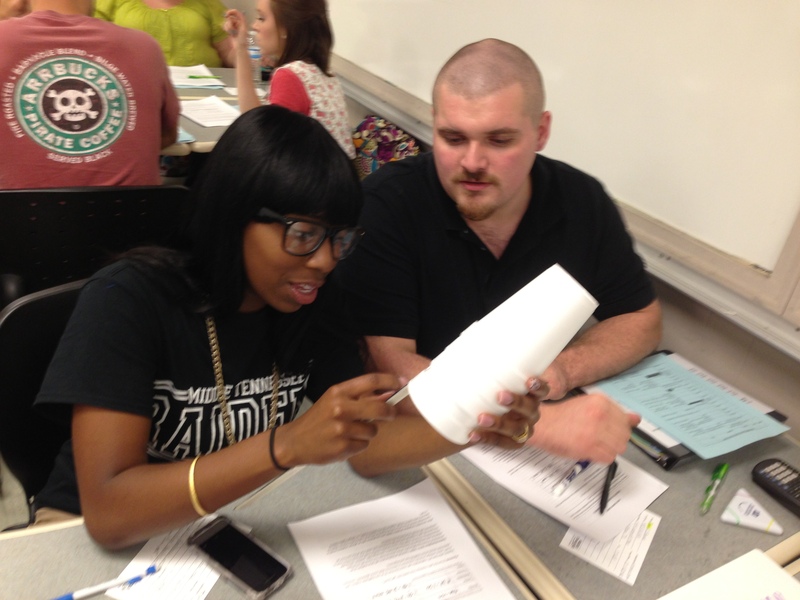 But I was not able to model the learning environment that I wanted in subsequent classes. 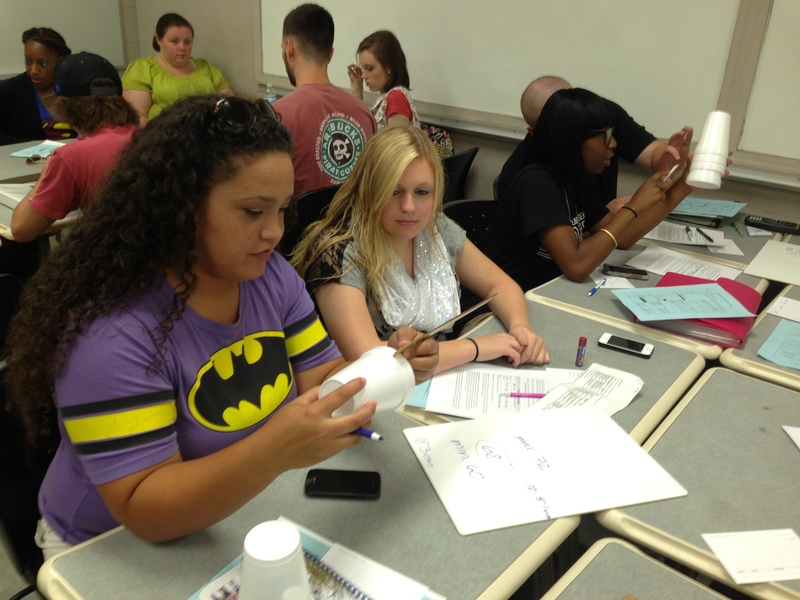 I flat out stole Dan Meyer’s styrofoam activity (he details it more here). I. Group into 3-4 students per group. I rearanged the furniture so thay had to look at each other. II. You say, how many stacked cups would it take to reach the top of my head? You hold one up. III. Ask for them to guess. I had them write the guesses on the whiteboard and hold it up. Ask for a realistic minimum; ask for a realistic maximum. I then wrote these on the board. They took a lot of time with this. They did not seem to be comfortable estimating. A lot of them were really close, and 1 was correct to the nearest cup (84). IV. 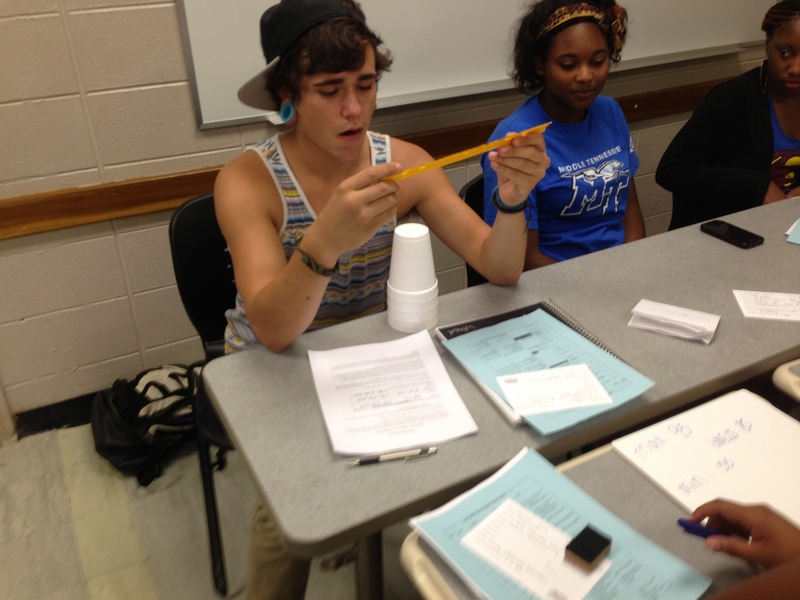 I passed out 3-4 cups and a ruler per group. I walked around and ask the groups how they are going to figure it out. They will, of course, need to know how tall you are. Using centimeters will help keep the numbers fraction free. In my case I am about 183 cm tall. My cups had a lip height of 2 cm and a base height of 10 cm. I ask them what they need to know if order to solve it. One group honed in on the common sense solution really fast (number of cup lips x 2cm + base height of 10cm gives us the stack height). V. Most groups thought they new what was going on. One was really strugling on knowing where to even begin. Asked: “How would you determine the height of 3 cups.” Answer: “I’d measure it” Fair enough. “OK, how would you find the height of the cups if you did not have a ruler, but only the measurements of the cup (and lip)?” I then left them to think about it. It is important to withhold the actual “solution,” as there are many ways to get there. I want them to see that there is often more than one pathway to the answer. VI. Then I had them put their new (and hopefully improved) guesses on their whiteboard and hold it up. I wrote these down on the whiteboard in front of the class. Then the moment of truth. How would their model stack up (no pun intended) to the actual stacking of cups. All but 1 were within 3 cups. What will I do next time to improve it? I did not do a good job of getting them to tell me how they modeled it. 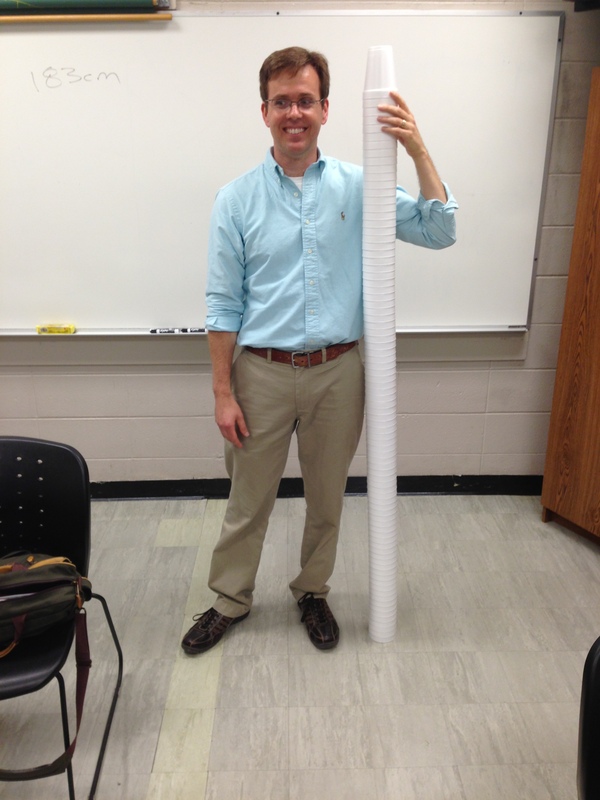 We were near the end of the 55 minute class and I had to make sure we got the cups stacked up. I did not mention the pattern or formula to them, and, perhaps I shouldn’t. But I should have pushed for them to give me their perceived pattern. We will most likely revisit this problem when we learn of linear equations in two variables.